Ecological interactions between predators, prey and competitors have already been disrupted by climate change, through changes in the abundance of interacting species, quality of food supply or timing of biological processes. Common Cuckoos Cuculus canorus are brood parasites that exploit their hosts by timing their migration with the reproductive cycle of their host and are at risk of phenological mismatch with hosts through climate change. The proportion of hosts used that are resident and short-distance migrants has decreased with warmer spring temperatures. SOURCE: Møller et al. (2010) Proc. Roy. Soc. Lond. B 278: 733–738. Common Cuckoo Cuculus canorus has advanced its migration time from its wintering grounds very little over the past century (mean rate of advancement of arrival date 0.13 days per year), similar to its long distance host species (0.15 days per year). Short distance migrants however appear to be tracking temperature changes more closely (advancement of 0.37 days per year) (Saino et al. 2009), which could result in a mismatch in timing between some races of cuckoo and their hosts. Common Cuckoo is known to consist of many races (known as gentes), with each race specialised in parasitizing a particular host species (Gibbs et al. 2000). Females from each race are therefore well adapted in mimicking the eggs of their host, in terms of size, shape and colouration. To determine if a mismatch was occurring between Common Cuckoo and host, a range of sources—scientific literature, nest recording schemes, museum collections—were utilised to gather all known cases of cuckoo parasitism in Europe between 1850-1940 and 1941-2009 (Møller et al. 2010). The proportion of hosts parasitized (resident, short distance or long distance migrants) were compared between the two time periods, and the proportion of nests parasitized in the period experiencing the largest changes in climate (1990-2009) then compared to changes in temperature. In areas where spring temperature had increased more, proportionately fewer nests of resident and short distance migratory hosts were being parasitized by long distance migratory cuckoos, despite the relative abundance of these hosts increasing in the same time period. This suggests that cuckoos may be unable to track changes in climate, resulting in the reduced used of certain hosts. 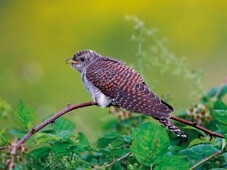 The persistence of different cuckoo races may therefore be influenced by climate change, as some hosts may be breeding earlier, before the cuckoos have arrived. Gibbs, H. L., Sorenson, M. D., Marchetti, K., Brooke, M. de L., Davies, N. B. and Nakamura, H. (2000) Genetic evidence for female host-specific races of the common cuckoo. Nature 407: 183–186. Saino, N., Rubolini, D., Lehikoinen, E., Sokolov, L. V., Bonisoli-Alquati, A., Ambrosini, R., Boncoraglio, G. and Møller, A. P (2009) Climate change effects on migration phenology may mismatch brood parasitic cuckoos and their hosts. Biol. Lett. 5: 539–541.